I love the Master Gardener program. For those who don’t already know, Master Gardeners are volunteers who are trained through the local Extension Service to help people with their gardening questions and problems. So I really enjoyed reading this article about Melina Meshako, a Prince George’s County Master Gardener who made some big changes on Joint Base Andrews, a military facility in Prince George’s County. What was most impressive to me was that Ms. Meshako suggested MD Bay-Wise certification for all the common areas around on-base housing. MD Bay-Wise Landscaping is a pretty extensive certification program for properties that adhere to certain specification that make their site more eco-friendly, which of course, makes it friendlier to the Bay. But despite the many requirements of the program, Joint Base Andrews was able to succeed with their certification. To get your property certified, you have to meet all of the requirements for the appropriate “Yardstick” for certification. You complete “The Yardstick” and contact the Master Gardener program in your county. I checked out The Yardstick for Homeowners. 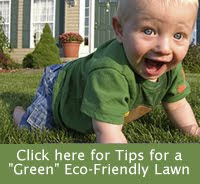 There are various eco-friendly landscaping practices and you check all of them that apply to your property. Each practice has an “inch” value of 1 – 9 inches. Your property much achieve 36 inches to be certified. For example, you can add one inch for every rain barrel you have installed, 5 inches if you don’t use pesticides, and 9 inches if you don’t have a lawn.